Exactly one year ago, Warner Bros. and DC Comics announced their insane 9 movie line-up that will take them through 2020. It sounded very ambitious, and some didn't think it was possible. But here we are, and Batman v Superman: Dawn of Justice is in the can, undergoing post-production work as it rockets towards its March 2016 release date. The second movie on the slate is Suicide Squad, which is currently shooting in Toronto. More than three quarters of the film has been completed, and we've already seen the first teaser trailer. Now comes official word that the next two movies in this amazing line-up are ready to go. Wonder Woman will arrive June 23, 2017. Director Patty Jenkins is currently in London, prepping Diana Prince's first solo big screen adventure. The character will first be seen in next year's Batman v Superman: Dawn of Justice trailer. Gal Gadot has long been attached to play Wonder Woman, and we've already seen her in action, with a few select moments teased in the second Batman v Superman: Dawn of Justice. Announced just this past week, Chris Pine will play her boyfriend, Steve Trevor. No official plot details have been released, but it is expected that Diana Prince will be seen in various different decades, and will fight during World War II. It is confirmed that principle photography will begin on Wonder Woman this fall and stretch throughout the Winter. It's more than likely that Comic-Con 2016 will bring the first footage or teaser trailer. 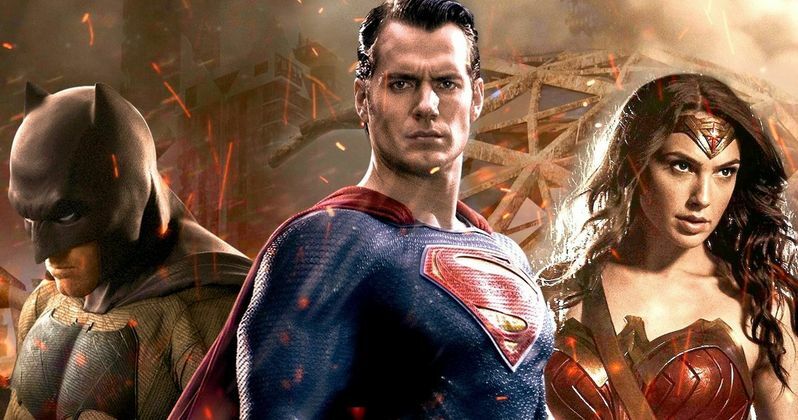 Gal Gadot will then move directly into Justice League Part 1, where she will reunite with her Batman v Superman: Dawn of Justice co-stars Henry Cavill and Ben Affleck. Zack Snyder is directing this first in an epic two-part DC Comics adventure. Justice League Part 1 officially begins shooting in Spring 2016, with production to last throughout the summer. We have yet to hear any concrete plot details. But it is likely that we will also see our first evidence that the movie truly exists at Comic-Con 2016, with next year's event proving to be another big one for Warner Bros. and DC. The movie will open in November 2017, arriving in time for the Thanksgiving holiday. Batman v Superman: Dawn of Justice will serve as a gateway into both Wonder Woman and Justice League Part 1. And it will introduce Jason Momoa as Aquaman. Also expected to make an appearance at the end of this superhero battle royal are Ezra Miller as The Flash and Ray Fisher as Cyborg. Though, their presence has never been confirmed by anyone associated with the movie. It's believed that Green Lantern won't make his presence known until the third act of Justice League Part 1. It was confirmed at Comic-Con that the reboot is officially titled Green Lantern Corps. It will be the last of the solo adventures in DC's Phase 1, and at this time, the Lanterns are the only superheroes yet to be cast. Tyrese Gibson is heavily rumored for the role of John Stewart. He has confirmed talks, but nothing official has ever been announced. Earlier this month, it was announced that screenwriter Chris Terrio had completed the screenplay for Justice League Part 1, though it isn't known how many drafts the story has gone through. And no further details were released. Chris Terrio is also responsible for the final draft of Batman v Superman: Dawn of Justice, and is said to have rewritten the first Justice League Part 1 draft turned in by DC Cinematic Universe mainstay David S. Goyer. Are you excited to see the DC Cinematic Universe finally coming together with some gravitas and weight? This looks much deeper, darker and dramatic than what Marvel has planned throughout the rest of the decade. But that doesn't mean DC isn't ready to have at least a little fun. We hope!